From the author of Project Nemesis! While studying the Great Pacific garbage patch, the Magellan and its crew are blown hopelessly off course... and into the bay of a strange island that seems to be uninhabited by unnatural creatures. 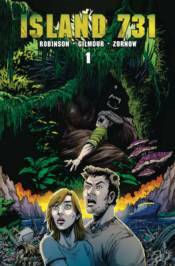 Jeremy Robinson and Kane Gilmour take The Island of Dr. Moreau and give it a kaiju twist in this series based off the best-selling novel!